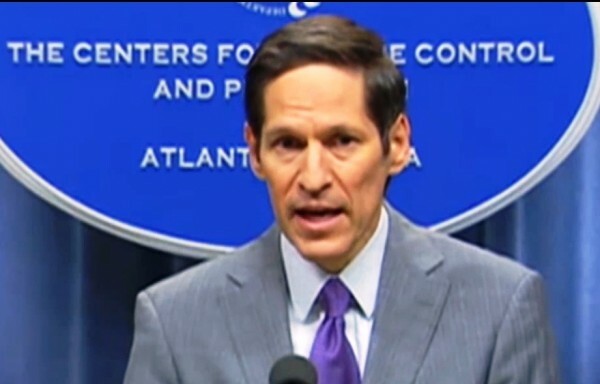 At a press conference Tuesday afternoon, Tom Frieden, the director of the U.S. Centers for Disease Control and Prevention (CDC), announced the first case of Ebola from the current epidemic who was diagnosed outside of Africa. The patient arrived in Dallas, Texas, on 20 September to visit relatives. Until today, the handful of people with Ebola in the United States were all diagnosed in Africa, carefully transported, and immediately provided with care in isolation units at hospitals. The new patient had his temperature taken before boarding the flight out of Liberia on 19 September, U.S. officials say, and had no disease symptoms at the time. He first started feeling ill on 24 September, sought medical care two days later, and was hospitalized on 28 September. Labs at the CDC and the Texas Department of State Health Services both reported that his blood tested positive today for the Ebola strain circulating in West Africa. Two ScienceInsider reporters called in to the press conference, but there was so much interest from the media that they did not get a chance to ask a question. Here, however, are some of the questions they would like to have asked. Q: Dr. Frieden, it sounds like the patient wasn’t tested for Ebola when he first sought medical care, on 26 September, even though he had just arrived from a country with an Ebola epidemic. Why not? Did the health care provider who saw him know he had arrived from Liberia six days earlier? Q: How many health care workers and how many others came into contact with the patient before he was isolated? Q: You said the patient’s contacts are now being monitored. Can you give some details about this? Does it include going to their homes and taking their temperature daily? Or do you communicate with them by electronic means, such as phone calls, text messages, and e-mails? Q: Are contacts being told to isolate themselves from their friends and family while they are being monitored? Q: Does the government have any legal authority to force potential contacts to cooperate if they don’t want to? Are they free to travel? Q: Has the house where the patient was staying been disinfected, and if so, how exactly? Q: What experimental therapies are available now for the patient, should he want to use them? Would you recommend anything specific? Q: Does the patient or his family members have an idea about how he got infected? Q: Virologist Heinz Feldmann has described procedures at the airport in Monrovia as a “disaster” and said it was the most dangerous situation he encountered during his visit to Liberia. Could the patient have become infected at the airport? Is that possibility being investigated? Q: What is the estimated number of people entering the United States each week who have recently been in one of the countries affected by the epidemic? Q: The number of Ebola cases is roughly doubling every three weeks; CDC’s own worst case-scenario says there may be as many as 1.4 million patients by 20 January. Should the US and other countries prepare to see imported cases on a regular basis? Q: The World Health Organization has raised the possibility that Ebola could become endemic in West Africa. If that happens, how should the U.S. deal with people traveling from these countries in the future? Q: One more question, Dr. Frieden. The United States is paying a lot of attention to this single case right now. Do you think that will increase the amount of money and number of people the U.S. is willing to dedicate to containing the outbreak in West Africa?